A BUBBLING CAULDRON: Charter Committee Wraps It Up! Charter Committee Wraps It Up! 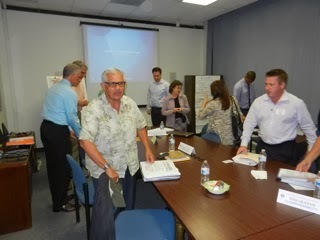 Last night the Costa Mesa Charter Committee used an extended meeting - four hours! - to wrap up their final version of the document they've spent the best part of a year cobbling together. And this meeting, which should have been a walk in the park, still ended up with some high drama before it was all over. FINE TUNING - WITH A CHAIN SAW! The end result will be a short document - six or seven pages, depending on how it is formatted - that seems to not significantly change anything. Almost every element included in the document is possible to accomplish under the current General Law rules that govern our city. For that reason, this effort has been a colossal waste of time and resources. 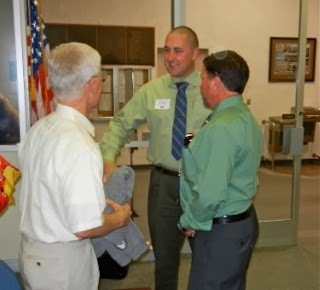 However, as the discussion worked its way to this issue last night, committee member Andrew Smith (shown here with Amburgery and Ramos) balked. After all that hard work and negotiation among the members previously, he feared that the voters would only see it as a move to double the council's salaries and that, alone, would drive a stake in the heart of the Charter. 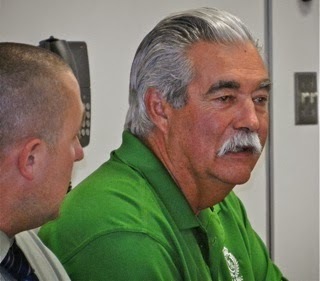 Back and forth the discussion went and, eventually, the committee agreed with Smith and the language will be amended to indicate that the council will receive salaries consistent with state law. 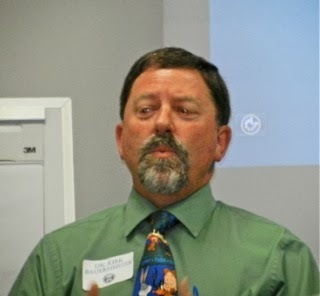 As a sidebar - if they had NOT included specific language regarding salaries it would theoretically been possible for a future council to pay themselves big bucks - as in City of Bell big bucks - because the Charter language is such that if something is NOT specifically mentioned the council can pretty much do what they wish. That's something to remember. 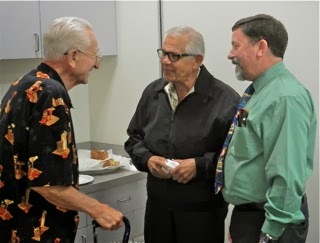 Member Gene Hutchins - a nice guy (shown here with Tobin and Bauermeister) - had another of his Unfunded Pension Liability meltdowns. Even though committee members are supposed to present new ideas or expansion of old ones by the Friday before their Wednesday meetings, Hutchins has consistently - and frustratingly - brought what he thought was significant information to the committee the NIGHT of the meeting. Last night - their last night - was no exception and things got just a little heated as he just would not take no for an answer. As had been the case throughout this process, every time the subject of Unfunded Liabilities was mentioned he practically launched from his chair, eager to get into the discussion. He's also a member of the Pension Oversight Committee and, apparently, has enlisted that entire group to help him craft language for the Charter on Pensions. 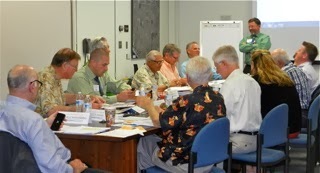 Keep in mind that the Pension segment had already been put to bed at a previous meeting. This time, though, he brought several NEW segments he insisted were crucial for the Charter. In the end his ideas failed to gain support from the committee. I'm not going to begin to try to give you all the language because there are segments that need to be burnished by the legal staff based on last night's activities. Nor can I give you the final version of the Preamble for the same reason. Here's the tentative schedule of events as this process moves downstream. Keep in mind, the deadline for placement on the November ballot is August 8, 2014, so the council has plenty of time for manipulation of this document and to hold workshops, town halls and whatever other form of community outreach they feel is important to sell this document to the voters. There's also plenty of time to tinker with the document to satisfy personal objectives. 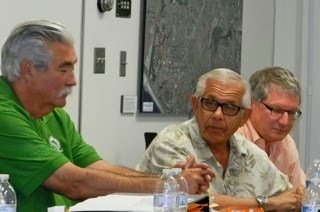 Last night, as the committee met for what will likely be the final time as a group except for the reception that will be held for them immediately preceding the March 18th council meeting, they went around the table to share their thoughts on the experience. Some of the comments were quite moving and obviously very sincere. 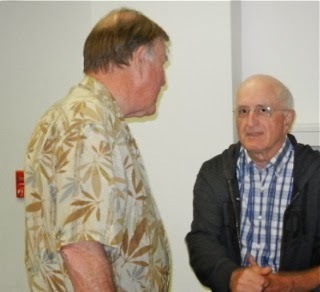 Member Hank Panian's (shown here with Harold Weitzberg) comments were particularly moving. He was on the original charter commission back in the 1970s. 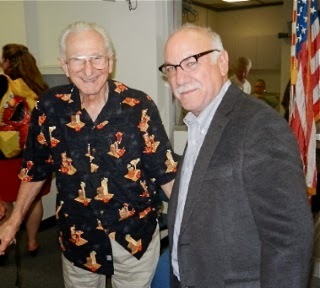 He spoke of having been part of the group that founded what is now Mesa Water District back in 1960 and he helped create the Newport-Mesa Unified School District also during that decade. He said he was grateful because through this committee he, "Finally have a chance to help shape the future of the city." The common thread through them all was that each one learned a lot during this process, gained new respect for individuals and the staff and were uniformly glad they participated. Congratulations to them, the facilitators and staff for all the work they did. Now we see what happens with this work product. We'll see if the council decides to add items to it or make changes at all. The next couple months will be very interesting.